NEO Find 1.0 Free Download - NEO Find provides a revolutionary approach to truly solve your email retrieval! NEO Find provides a revolutionary approach to truly solve your email retrieval! Finding emails: how it should be! All your emails at your fingertips - lightning fast. Also difficult to find your emails in Outlook? Although Outlook is a very powerful program, most users find it hard to quickly retrieve older emails once they are stored away in a filing system. 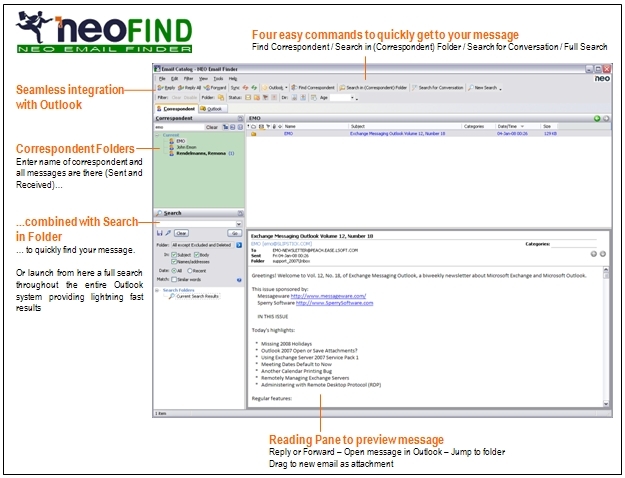 NEO FIND is designed to fill this gap providing a highly innovative Email Find solution. Never without your messages anymore - they are at your fingertips all the time. Stop searching, start finding your emails! Take full control over all your emails! NEO Find provides a revolutionary approach to truly solve your email retrieval issue. Combining Caelo's award-winning technology with automatic email organization around all Correspondents for both sent and received emails, NEO Find delivers the most natural and intuitive way to look for your emails: just select the correspondent you are looking for and all your messages are there. Zoom-in by performing a Search in Correspondent or by applying a Filter and your email is retrieved within seconds. NEO Find: The only tool available which is not searching your emails but is automatically organizing them so you can find your emails where you expect them to be. Statement: First, please download the orginal installation package by clicking the download link. Of course you may also download it from the publisher's website. Using NEO Find crack, key, patch, serial number, registration code, keygen is illegal. The download file hosted at publisher website. We do not provide any download link points to Rapidshare, Hotfile, Depositfiles, Mediafire, Filefactory, etc. or obtained from file sharing programs such as Limewire, Kazaa, Imesh, Ares, BearShare, BitTorrent, WinMX etc. Software piracy is theft. If you like NEO Find please buy it.